This sturdy make-believe telescope mounts on any Playset to provide imaginative fun for young pirates, explorers and ship captains. The Meadowvale II is a fantastic wooden playset, ideal for younger children (ages 3 to 10). The Meadowvale II features a large play deck (98 cm by 68cm), which is covered by a UV resistant and colour-matched vinyl roof to protect your kids come rain or shine. The slatted walls of the 120 cm high play deck offer a real fort feel, and with the addition of accessories like a steering wheel or telescope, your childs imagination is sure to really run wild. Below the play deck is space to create a sand play area, a ball pit area or even a place to store away garden toys. The Powerhouse Silver Playset will be the focal point of outdoor play in your backyard. It has 24 sq. ft. of play deck with 16 activities. It includes the giant scoop wave slide, climbing steps, bronco rider, picnic table, play handles and additional anchors. This family friendly single tower playset is sure to please! The Alpine Custom set offers four different design options (specifies sturdy 4 inch by 4 inch and full dimensional wood construction) and includes an award-winning, patented bracket system that cuts building time in half. Each playset project can be customized with accessories that you select yourself (sold separately). The kit includes two swing seats, a pair of safety handles, a multi-coloured canopy, brackets and hardware, and easy to follow assembly instructions (all lumber sold separately). 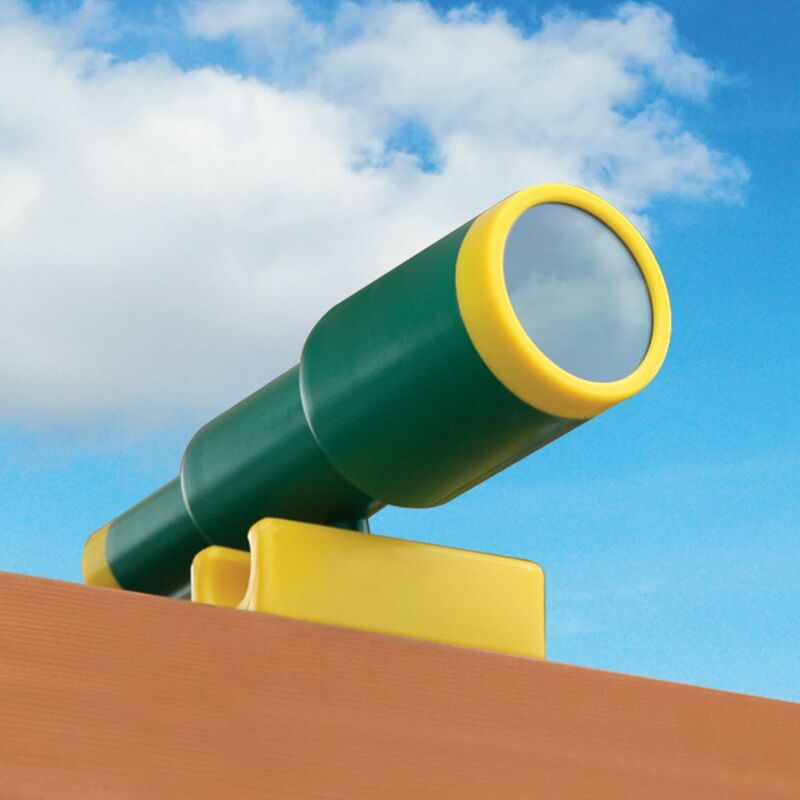 Green and Yellow Play Telescope This sturdy make-believe telescope mounts on any Playset to provide imaginative fun for young pirates, explorers and ship captains. Green and Yellow Play Telescope is rated 3.0 out of 5 by 1.